Dr. Young Park at Fort Valley State University, Georgia, was invited to train about 30 small farm dairy goat owners in Nebaj area, Guatemala, for production of quality goat milk and its products, by USAID Farmer to Farmer program for July 23-Aug. 6, 2017. After completion of training on goat milk cheese manufacture for small goat owners at Nebaj/CEPROCAL facility in Guatemala, photo taken with Dr. Young Park seated at the second seat in the front row. Training lectures on Benefits of Goat Milk by Dr. Young Park for professors from University of San Carlos, Technicians of the Save the Children program from different districts, and USAID and NGO professionals in Guatemala City, Guatemala, August 1, 2017. Dr. Y.W. Park (front row center) made visitation to Nepal Dairy Pvt. Ltd. (Executive Chairman, Dr. H.B. Rajbhandary, seated first row with hat), Kathmandu, Nepal, June, 2017, for prospective research collaboration and consultation. Signing MOU between two research laboratories for dairy science research collaborations of Prof. Y.W. Park at FVSU and Prof. Hong Koo Lee at Kon Kuk University, Seoul, Korea, June 14, 2017. Y.W. Park delivers a lecture on “Management of Health for Pastors and Ministers” for Haitian pastors with the assistance of an interpreter at Santo Domingo, Dominican Republic in January, 2016. Invited Kenote Speakers (Y.W. Park and Y.J. 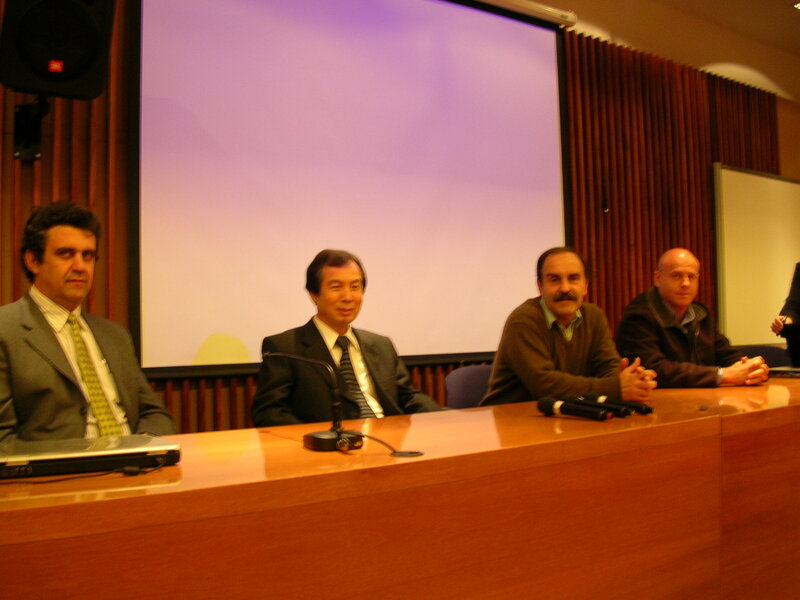 Choi) and officials at the annual conference of the 2015 Korean Society of Animal Food Products, Jeonju, South Korea. Y.W. Park sharing his personal professional testimonial book with the Bright Future Global Acadamy students in Ulaanbaatar, Monoglia, June 2015. Keen interest in the invited lecture delivered by Y.W. 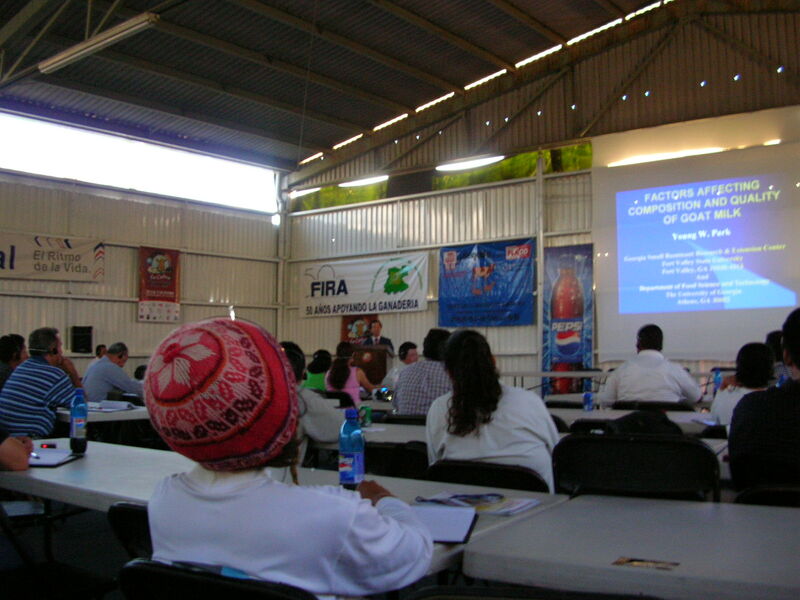 Park at the 2nd International Goat Symposium, Mexican Dairy Goat Association, Celaya, Mexico, October, 2005. The largest Dairy Goat Operation in United Kingdom, St. Helen Farm, York, England; One of the 6 milking dairy goat herd barns; Pictured with Owner and Y.W. Park. International Cheese Competition (Judges invited from France, USA, Spain and Italy; judges are with white gowns), Mercolactea International Dairy Conference held at Cordova, Argentina, May, 2008. 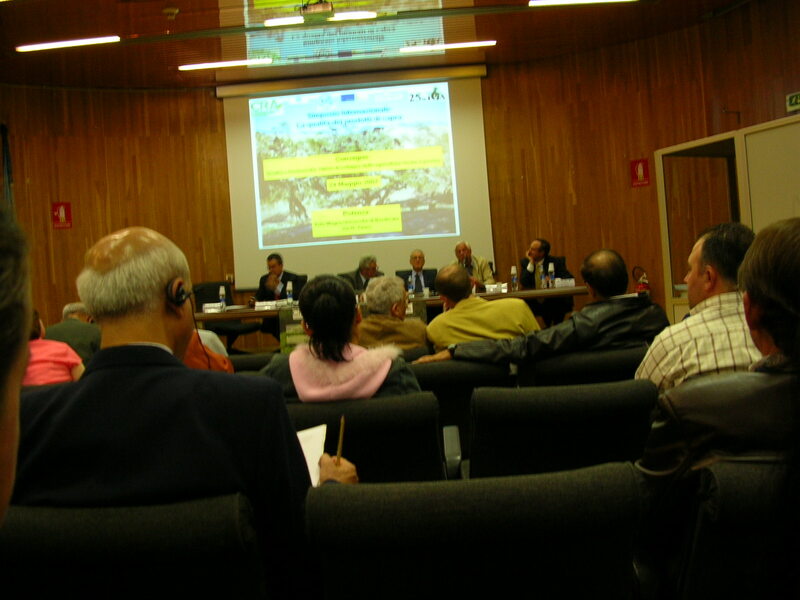 Symposium Speaker, The International Symposium on “The Future of The Sheep and Goat Dairy Sectors.” Hosted by the International Dairy Federation at Zaragoza, Spain, October, 2004. The founder, Dr. Young W. Park is professor of Food Science at the Georgia Small Ruminant Research & Extension Center, Fort Valley State University, Fort Valley, Georgia (USA), and an Adjunct Professor Emeritus at the Department of Food Science & Technology, University of Georgia, Athens, Georgia (USA), and currently an Adjunct Professor at the Mongolia International University and Mongolia Huree University, Ulaanbaatar, Mongolia. Previously, he served as Associate Professor and Research Scientist at the International Dairy Goat Research Center, Texas A&M University System, Prairie View A&M University, Prairie View, Texas (USA) during 1982-1997. His research has been centered on dairy goat products development and their quality evaluation studies for the past 37 years. Recently, Dr. Park published 8 well known books that have drawn worldwide attention to dairy scientists, food scientists, nutritionists, allergy specialists, health professionals and consumers. His first book released in 2006 entitled, “Handbook of Milk of Non-Bovine Mammals” has been translated into Spanish and Chinese editions, and the second edition has been published in May 2017 . His third book, “Bioactive Components in Milk and Dairy Products“ published in 2009 also has been in high demand around the world, and has been translated into Chinese in 2015. Dr. Park’s 6th book, “Milk and Dairy Products in Human Nutrition” has been published in 2013. Furthermore, he has published the most downloaded article in Small Ruminant Research Journal since 2007. Dr. Park has more than 350 publications including 8 books, 43 chapters, 85 refereed journal articles, 200 abstracts, approximately 35 invited papers in national and international symposia and conferences. Dr. Park has been nominated to the 2000 outstanding scientists of the 21st century three times by the International Biographic Centre, Cambridge, England, since 2000. The dairy production in the U.S. and Western world has been virtually dominated by the cow milk industry. The dairy goat industry will never be able to compete with cow dairy counterparts in terms of volume of production. The goat milk industry has faced many challenges for its survival, including the seasonality of milk production and development of superior quality dairy goat products attractive to the consumers. There has been, however, more demand than supply for goat cheeses in Georgia and other states especially in specialty gourmet restaurants. In order to meet this demand and overcome the barrier of the seasonality of goat milk production, many extensive research are required to discover effective solutions for this inherent natural challenging problem. Some limited literature have shown that the processing and holding of precheese or finished cheese in frozen storage for later use, or production of the frozen products using ultrafilteration, as an alternative. On the other hand, with the recently funded research grants by the USDA, Dr. Park and his research group have successfully demonstrated the feasibility of frozen goat milk cheeses during peak milk production season and market the products later during off-season, although freezing cheeses is not in common commercial practice. This successful research outcome has shown a great positive impact on year-round marketing of dairy goat products including the off-season period, and greatly enhanced the sustainability and profitability of the dairy goat industry. The subsequent studies conducted by Dr. Park’s laboratories have positively identified the food qualities and shelf-life of the frozen-stored goat cheeses were feasible and acceptable in regard to nutritional, chemical, microbiological, textural, and sensory qualities. These research results have been reported in several refereed journals, including J. Dairy Science, J. Agricultural and Food Chemistry, J. Sensory Studies, and Small Ruminant Research J. Goat milk differs from cow or human milk in unique characteristics, such as high digestibility, distinct alkalinity, high buffering capacity as well as certain therapeutic values in medicine and human nutrition. Goat milk has been recommended as an ideal substitute for those who suffer from allergies to cow milk or other food sources. Cow milk allergy (CMA) is a frequent disease in infants, but its etiologic mechanisms are not clear. Increased gastrointestinal absorption of antigens followed by adverse local immune reactions may constitute a major etiological factor in development of food allergies like CMA. Potentials of goat milk as the substitute for cow milk or the basis of cow milk-free diet are of great importance for infants and other patients with CMA as well as goat milk consumers and producers. 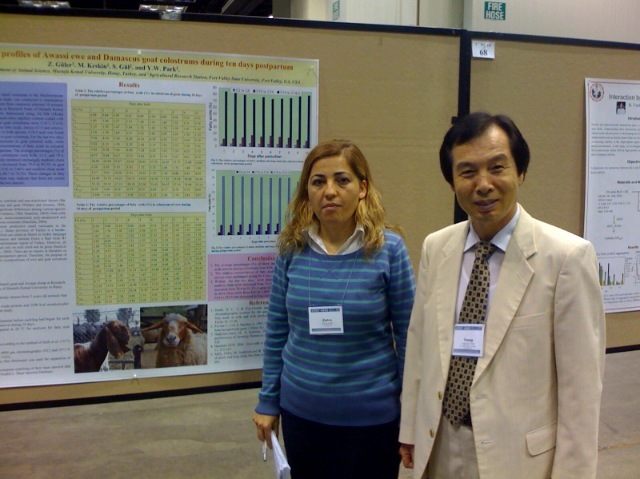 Recently, several studies have been conducted on the development of goat milk infant formulae in Dr. Park’s laboratories, of which the research findings have been published in reputed journals, such as J. Dairy Science, International Dairy J., J. American Oil Chemical Soc., and Foods and Nutrition Sci. J. The major focuses of the scholarly works by Dr. Park have been centered on: (1) Goat milk infant formulae development studies; (2) Goat milk, goat cheese, goat yogurt and other products quality evaluation studies; and (3) Nutritional, chemical, rheological, microbiological, sensory and flavor compounds characteristics studies in mostly caprine milk and dairy goat products. Thanks to the high visibilities of scholarly activities in dairy products research and publications in the international agriculture, Dr. Park has been invited to many international conferences and symposia to deliver special lectures, seminars and workshops. 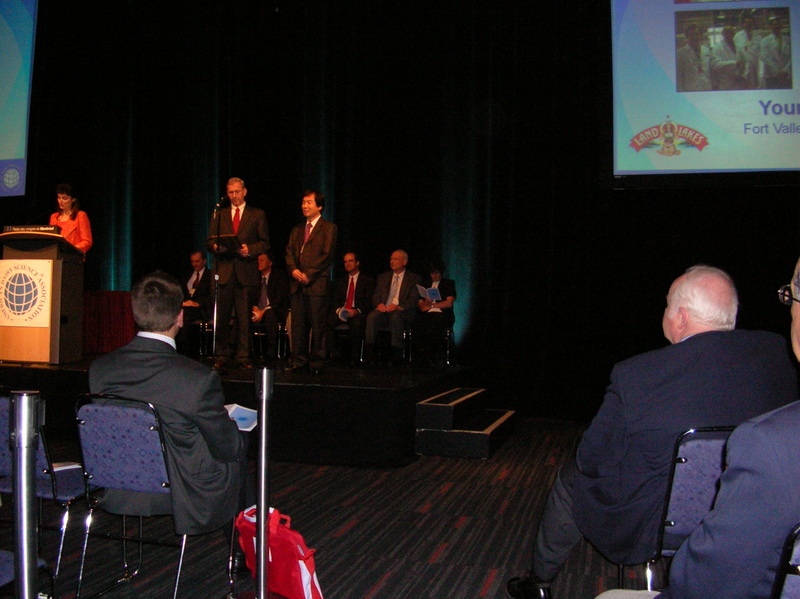 These special lectures and symposia presentations include the World Animal Production Society Conferences, World Dairy Summits, IDF sponsored International symposia, International Goat Conferences,1st Asia Dairy Goat Conference, International Congress of Nutrition, American Dairy Science/Animal Science Joint Conferences, and International Symposium on Food Safety Research in Korea, and Mongolia International University special lectures and laboratory training workshops. These activities have been held in many countries including Finland, Brazil, India, China, New Zealand, Australia, Italy, France, Spain, England, Korea, Mexico, Canada, Argentina, Mongolia, inner Mongolia, Malaysia and United States. 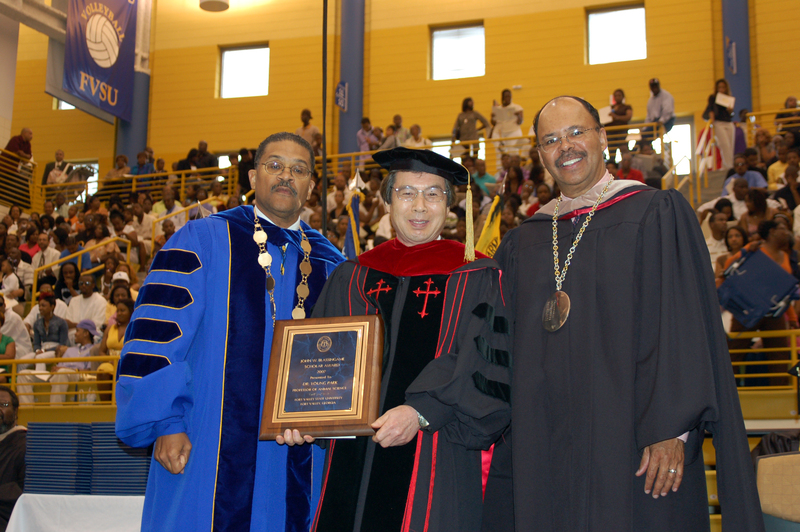 Dr. Park has been awarded many achievement awards, including Morrison-Evans Outstanding Scientist Award , Land O’Lakes, Inc. Research Award , Kraft Foods Teaching Award in Dairy Manufacturing, John W. Blassingame Outstanding Scholar Award, Research Leader Award, and Distinguished Faculty Award, and Distinguished Alumni of the Year Award from his Alma Mater University. Since 2010, being appointed as an international honorary scientific advisor to the Rural Development Administration, Ministry of Agriculture and Fishery, Republic of Korea, Dr. Park has provided scientific and technical assistance to Korean Green Technology in dairy products development and evaluation research, and scientific publications. He also has been invited to Mexico, Argentina, Mongolia, Inner Mongolia, Malaysia, China and Korea as an international collaborating scientist and field consultant for developing, manufacturing and marketing of goat and small ruminants dairy products, and also conducted workshops for local students, scientists, dairy farmers and manufacturers. 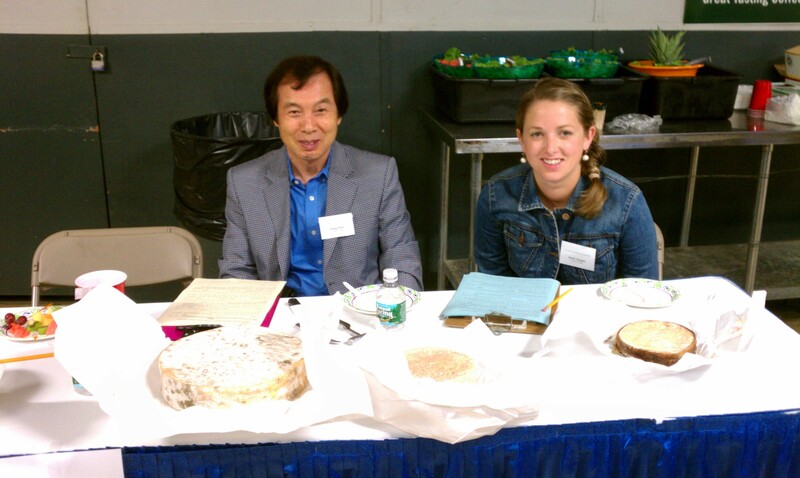 Dr. Park has been invited as national and international cheese competition judge, such as Eastern States Exposition, National Cheese Competition, West Springfield, MA., and Mercolactea International Dairy Conference, Cordova and Buenos Aires, Argentina, as a cheese competition judge and invited lecturer. A number of research and consulting activities in international dairy foods in several countries have been performed for the establishment of dairy goat industry in Korea, especially in studies on therapeutic and hypoallergenic values of goat milk in infants and cow milk allergic patients. 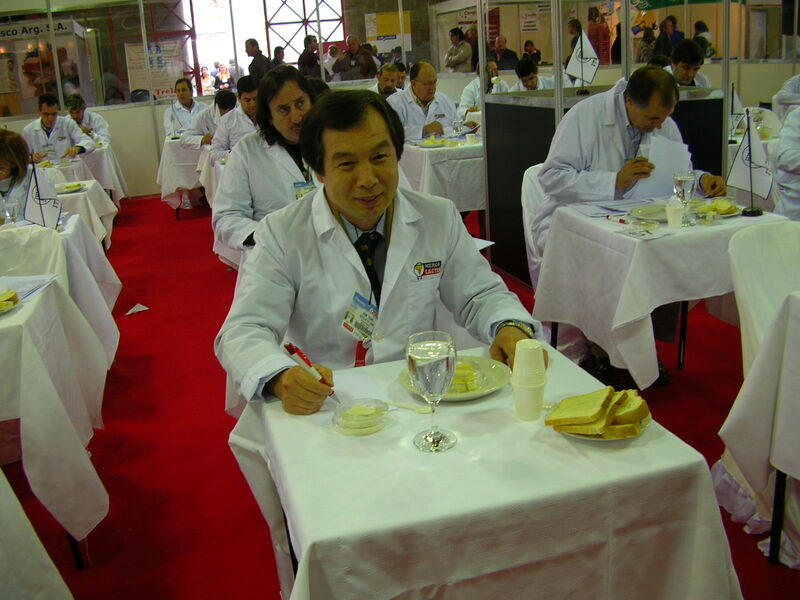 With respect to the International Dairy Federation (IDF) activities, Dr. Park has served as the US chair for Committee in Heavy Metals in Milk for the IDF during 1990-2000, and also served as a member of US committee on Somatic Cell Counts in Goat and Sheep milk for the IDF for the same period. He has been the designated institutional representative in his institution for the US-IDF committee activities. Classroom instructions are essential for training the next generation’s capable dairy production leaders. Through his teaching career for the past 33 years of higher education, Dr. Park has taught dairy production, food chemistry, food processing, food analysis, nutrition laboratory, dairy products technology and food preservation and hygiene at four different institutions. He has been a mentor and trainer for visiting scholars and postdoctoral scientists in his laboratory, such as Turkey, Egypt, Armenia, France, Korea, and Honduras. Dr. Park also produced a number of international graduate students with M.S. and Ph. D. degrees for the past three decades, where these students have been direct or indirect contributors to the advancement of international dairy foods production and their processing in their native countries through their education, scientific research, agri-businesses, manufacturing and other dairy products related activities. Dr. Park has served as an editorial board member for several journals, including Small Ruminant Research J., Foods and Nutrition J., and Open J. of Animal Science, and served as an expert reviewer for 20 other journals. Having been involved in bi-vocational professions, he has been an active minister serving physically and spiritually needy people at local, national and international levels since 1987. He earned a Doctor of Ministry degree at Chicago, IL, USA in 1998. Although he has retired from his active ministry, Dr. Park has been a devoted volunteer minister at local nursing homes as well as at the local chapter of the Habitat for Humanity to serve the underserved, the elderly, the widowed, and the orphans in Georgia and other countries. He founded a non-profit organization, the Living Water Missions, Inc. in order to give assistance to the socially disadvantaged and less fortunate people.